In most railway stations, you will find a lot of people in the waiting room,sometimes even crowded and noisy. Don’t be shocked. It is very common in China especially on holidays. There will be a dining cart with food, snacks, box lunch/supper travelling across the carriage. Passengers could have meals at their own carriage. Besides, there is a dining carriage in the middle carriage of the train. 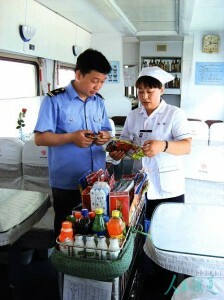 There are food selling on the train, however, most of them are more expensive than in the stores in city. So, it is best to buy some food for the train travel in advance. Chinese people often like to bring instant noodles, fruit and snacks on the train. Hot drinking water is available on the train. You have to prepare your own cup. Or you can bring your own water. Watch for your luggage and handbag and keep them in your sight when you are waiting for the train. Put the suitcase on the shelf when you board the train and take the valuable belongings with you. Pickpockets sometimes happen, but it is OK if you just be careful a little bit. If you are in a hard sleeper or soft sleeper, after you board on the train, the working staff will check your ticket and change it with a sleeper card. You will have your ticket back before the train arriving at your destination. The Spring Festival Holiday and National Day Holiday are the most busiest days for train travel. There will be so many people travelling by train. The train tickets are so hot that they will be sold out soon. Try to avoid train travel on the Chinese holidays. purchase two separate tickets…. Beijing to Shanghai and Shanghai to Guangzhou. Secondly, If tickets are purchased ONLINE are the tickets sent directly On line ( which we can print out) Or would we have to pay and then collect at Beijing Rail Station. Can Tickets be purchase from ‘Travel Agencies Portal, like YATRA OR OTHER AGENCIES’. Yes, you need to purchase two separate tickets. Click here to book train tickets. There are 2 options to get the paper tickets. One is that you book the tickets from our website and then we deliver the paper tickets to your hotel; the other is you book the tickets on our website and we give you a confirmation number, then you can print out the tickets on your own at the train station. I Plan to buy 4 soft sleeper for my family. Can i select seat so i can stay together with family on the train ? Seat selection is not available. If there are unoccupied cabin left, maybe you can stay together. It is not guaranteed.